The colors are pretty close, right? Last year I had the incredible luck to move into a great place in SF with 3 awesome roommates. The house itself is pretty shabby chic, but it has the great bonus of a backyard. When I was growing up in rural-suburban Pennsylvania, I’d garden every weekend with my family. We had three acres so there was always plenty of projects to work on. Sometimes I’d get tired of mulching and think, when I grow up I’ll live in the city and I won’t have to do any gardening! My last place was just like that – close to downtown, very little light, and 2 measly window plants I tried desperately alive. I missed gardening terribly and would look longingly out the window at the private garden below. So when I moved to a house with a backyard, I didn’t want to let it go to waste. I bought a dozen potted plants for the patio and planted tomatoes, a jasmine bush, and sunflowers that have finally bloomed (and are 12 feet tall!). My friend whose room I filled was the resident gardener when he lived in the house, and he planted a bougainvillea plant the year before that has had tremendous success. 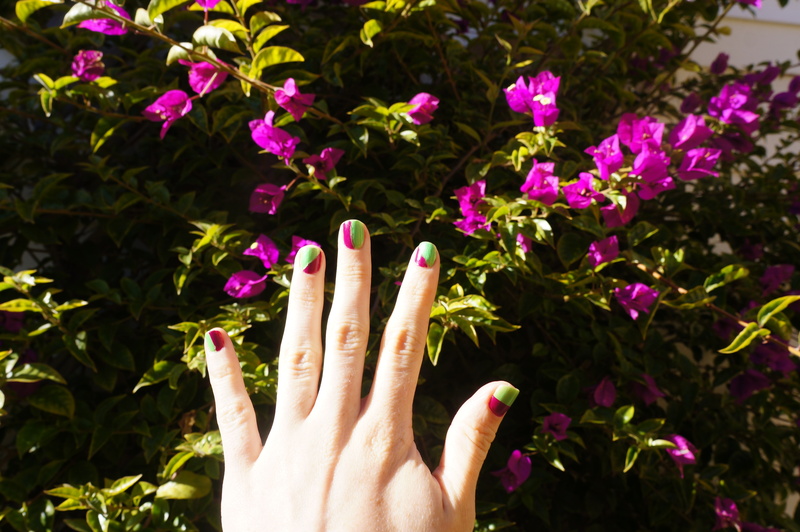 I was admiring the color combination the other day when I decided to do a flower-inspired manicure. And as always, this is a klutz-friendly tutorial. First I painted my nails with Julep in MacKenzie, a very bright apple green with a very slight shimmer. 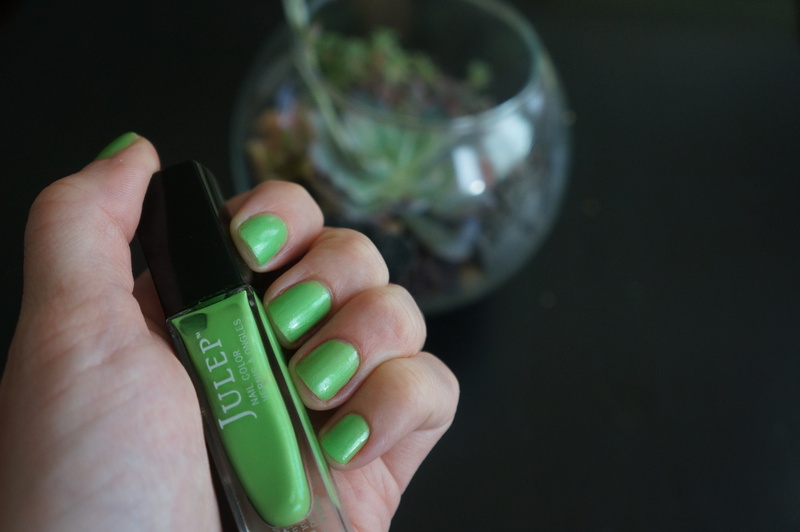 Remember that crazy Julep nail polish deal I wrote about back in June? Well this polish is one of the fruits of my online shopping labor, and I’m quite fond of it. Weirdly, it smells a bit like apples too. Although fair warning – this polish has a tendency to stain, so make sure you use a base coat. A cheap alternative is Sinful Colors in Irish Green – Amazon has it for $7 but I’ve seen it for $2 at your local drugstore. 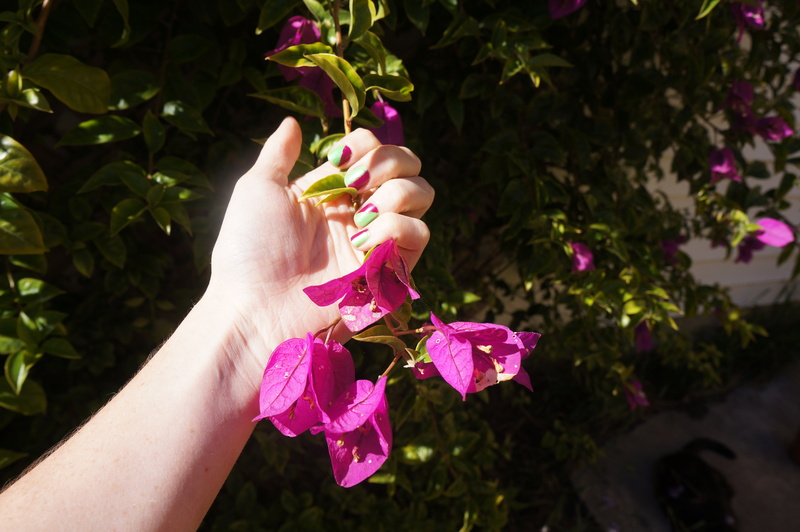 After you let the green base shade dry for a while (ideally a day), you can apply tape to your fingers to mimic the sharp edges of the bougainvillea. Ideally you should use painter’s tape, but as you can see I went with invisible tape, as it’s what I had on hand. Scotch tape is very sticky so I recommend applying the tape to your arm a few times to reduce the stickiness. I applied the tape horizontally, vertically, and diagonally in a random pattern across my nails. 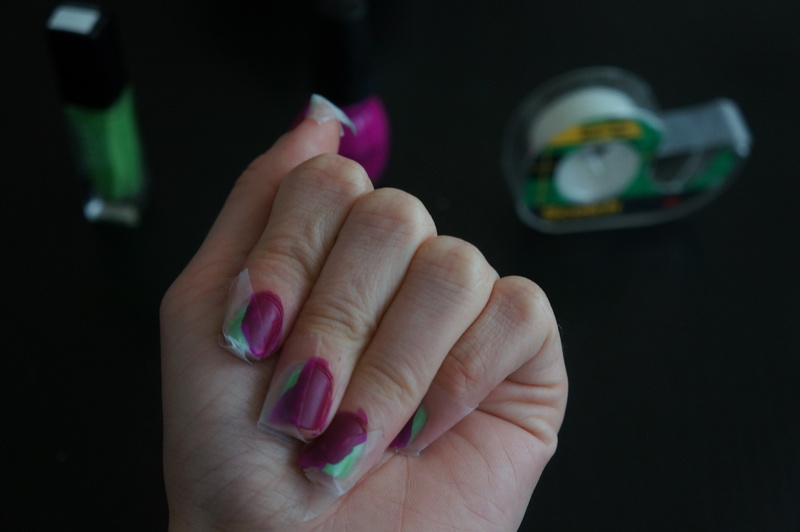 After you’ve applied the tape and sealed down the edges with your nail edge, apply a magenta shade. Because you’re layering on top of green, it’ll take a few coats to get a true color. Just make sure to let your polish dry fully between coats – a full 10 minutes. Once you’re certain it’s dry, remove the tape carefully with even pressure, and apply a top coat. Such a fun and simple look! Want a Free Beauty Birthday Gift? Check out Sephora’s VIP Present This Year!